Today, after having spent the last week meticulously packing, I embarked on the first leg of my journey to the Pamir Mountains in Tajikistan. Traveling to this remote location is no easy task, involving four separate jet flights totaling twenty-three hours of actual flying time, followed by sixteen to eighteen hours of jeep travel. On this particular trip there are to be no stop overs; just a series of relatively short layovers in a number of different airports. To me, the first big hurdle is checking the bags, including your rifle, through to the destination which is Bishkek. With England being much more antigun than America, and British Airways reflecting the viewpoints of its motherland, I was glad to be done jumping through all the hoops that were required of me at the ticket counter. Even though I had all proper documentation, I felt little confidence my rifle and cartridges would make it to the final destination. I did plan ahead by making sure that one of my bags which contained no rifle or ammo, did have all the essential clothing and footwear necessary to complete the hunt. As well, I had checked in advance to make sure the camp had a suitable rifle in case mine didn’t show up. As I write this, I have completed my first two legs of the journey and am now on board the third aircraft which, after a stop in Baku, Azerbaijan, will take me to Bishkek, Kyrgizstan. At that point I will have to retrieve whatever baggage BA has seen fit to deliver, and make my way to the gate where the flight to Osh will depart. By this time I expect to be functioning at the level of a walking zombie at best. Then, assuming I successfully make it on board that flight, I will be in for another four and one half hours of flying time. It was as I boarded my plane from London to Bishkek that I met up with my hunting partner and camera man, Michael Viljoen. I was late getting on board as I was busy faxing some paperwork to my office in Texas, and could see that Michael was somewhat concerned that I had not yet boarded the aircraft. It was good to see him again, after our trip to Tanzania only five weeks ago, where he filmed for me on my most recent African hunting adventure. This time we will actually be filming for each other, as we take turns hunting Marco Polo rams. As difficult as good video filming is at sea level, it is many degrees more difficult at the extreme altitudes we will experience on this hunt. It seems your brain slows down to a crawl, and nothing happens with any degree of clarity in your thought processes, almost as if you are severely impaired by alcohol! A much greater effort must be made to overcome both the physical and mental challenges experienced in such an environment. Only time will tell how effective our skills will be on this hunt! I will keep you posted as the hunt progresses. Michael and I finally arrived in Bishkek this morning around 4:30 AM local time. After traveling more than twenty hours, we are almost half way there! The news of greatest concern was, once our bags arrived, I realized the duffel containing my rifle was not among them. I had been warned by my travel agent, and several different guides and hunters that it was a bad idea to entrust the shipment of a rifle to a company as proven to be antigun as British Airways. They even charged me $140 excess baggage for the bag they did not deliver. Interestingly, the bag was not lost, it simply never left Chicago. I would encourage anyone planning a similar trip, or even a family vacation, to stay as far away from British Airways as possible. As Michael was also planning to use my rifle, neither of us have a weapon, and will have to see what we can come up with when we arrive in camp. We now have a three hour layover until our flight to Osh. Kaan Karakaya, our outfitter, has met us and we had a nice visit for an hour or so before our flight departed. Fortunately, our flight to Osh is only an hour and twenty minutes; then begins the dreaded jeep ride from hell! We arrived in Osh and were met by some of Kaan’s staff. After a quick lunch it was into the jeeps for the next fifteen hours as we ascended up the Old Silk Road that leads from Osh into Tajikistan, through Afghanistan, Pakistan, and finally into India. From my last trip here I remembered this as one of the worst experiences of my hunting career, and it turned out that my memory served me well! Once again we were on what seemed like an endless road of twists, turns, and innumerable bumps, jolts, and teeth jarring impacts with pavement that was no longer there. I did not think it would ever end, but finally, after thirteen hours, we arrived in Murgab where we would spend the balance of the night. We stayed at the house of Attabeck, one of the most famous Marco Polo guides ever to hunt for these magnificent sheep. The next morning we slept in until almost 10:00 and, after a breakfast of rice porridge, we were back on the road (if you can call it that) to our base camp known as Hot Springs. From this camp many great rams have been taken, some of which have exceeded 64 inches, as recently as last year. Arrival in camp was a very welcome experience and after getting settled in, we checked to see what might be available in the way of a shooting iron. A Russian 7.62 was produced which we shot a few times and frankly, it scared the hell out of me! Out of my first three shots the gun went of by itself once! Grouping at 100 yards was almost nonexistent, and we were very relieved when Attabeck came out with a Remington Model 700 BDL in 7MM Magnum, scoped with a Bushel 3×9 scope! After just a few shots I felt reasonably comfortable with it to 400 yards. More about the camp in my next installment. Its almost 11:00 PM and time for me to get some sleep. One final word is that camp is situated at just under 14,000 feet, and I really don’t feel all that bad. If I can get a good night’s rest I think our first day of hunting will be very exciting! I hope you are all well, and I look forward to bringing you the next chapter in this unusual hunt. I know it has been several days since my last update and apologize for not being more regular with my reports. This has been the most arduous hunt I have experience since the last time I was here. Each morning we have been up at 4:00 AM and arriving back around 9:30 at night. Temperatures have been warmer than expected but lack of snow has made stalking nearly impossible since we have not been able to utilize our snow camouflage which is the only truly effective camo in this environment. Too, the sheep are spending their afternoons much higher than normal (around 17,000 to 18,000 feet). 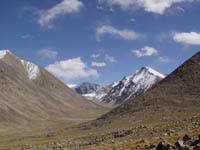 We have made several climbs into the heads of several valleys, starting at 13, 500 feet and climbing up to 16,500 feet. These have been exhausting affairs but have produced sightings of some magnificent rams. Unfortunately, the wind has often been in the sheep’s favor, resulting in their climbing beyond our reach where they would stare down at us as if we were some kind of joke! These have been very demoralizing experiences which we will continue to try to overcome in the short amount of time we have left. My friend and hunting partner, Michael Viljoen managed to take an outstanding ram two days ago, at last light when a group of rams came down to from their bedding area to feed in the valley. His ram measured 60 x 59 with very good bases. I will expand on that story when I return. Hopefully, I will have a story of my own to post as well! My hunting partner, Michael Viljoen, and I have made it out of the mountains after a grueling eight day hunt for Marco Polo Sheep. After a seventeen hour jeep ride out of the mountains, followed by a one hour flight from Osh to Bishkek, I am about to enjoy my first night’s sleep in a bed at less than fourteen thousand feet, in more than a week. But first, let me recap our hunt. After arriving at camp, the first couple of days hunting consisted primarily of jeep travel over some of the roughest terrain I have ever seen a vehicle traverse. There are no roads to speak of, and the small Russian jeeps we were using proved to be the toughest, most maneuverable vehicles I have ever seen. I think this was due in large part to the extremely short wheel base and high ground clearance which these jeeps had. Needless to say, we were bumped around in a way that would be hard to accurately describe, sometimes having to travel as much as two hours, one way, to the hunting area. Over the course of the first couple of days we saw incredible numbers of both rams, and ewes and lambs. On both days we totaled sightings of more than two hundred sheep in different valleys, half of which were rams. 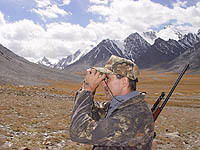 This being my third trip to Tajikistan, and having hunted different areas previously with sightings of similar numbers of sheep, it seems ridiculous for our U.S. Fish and Wildlife Service to list these sheep as endangered! This region holds vast amounts of both habitat and sheep, and are not remotely endangered, especially as long as they represent an economic value to the local populous through sport hunting. During the course of these sightings two facts became clear. The size of ram I was looking for was definitely present in this area, and, all of these sheep were incredibly wide awake, moving immediately away and generally up the mountain to escape any danger we may represent. Once alerted, these sheep could only be reached by climbing several thousand feet to the tops of the ridges where they sought sanctuary. Once they reached these lofty elevations they seemed content to let us view them through the spotting scope. I got the impression they somehow knew I had just come from almost sea level elevation, and posed no real threat! Having scouted the area by jeep while acclimating to the elevation, we chose to hunt our way up one particular valley on the third day, where we had already seen many sheep. This hike began at about fourteen thousand feet and continued slowly upward over about six kilometers, until we reached an elevation of sixteen thousand-two hundred feet. We saw many sheep, both male and female on our way in, and towards the head of the valley, Michael came very close to taking a ram out of a group of seventeen which we surprised at about two hundred yards. If not for some confusion between the two guides about which ram was the biggest, the third ram from the left would definitely have stopped a bullet. Michael was quick to pick out this ram as the largest and was lined up with the crosshairs on his chest. I was behind the video camera rolling the tape, just waiting for the guide to give him the go ahead for the shot on this very mature ram. It was all over in a matter of seconds as the whole group turned to depart. Michael had asked if he should shoot three different times, without a response from his guide. His disappointment was great as he saw a fine opportunity evaporate before his eyes. We continued to the very head of the valley where we were treated to a special sight. 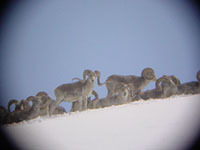 On the skyline at least two thousand feet above us were thirty-eight rams standing in a snow bank looking down upon us. We set up the spotting scope for closer examination and discovered the original group we had seen earlier had joined up with more rams that must have been in another group ahead of them. Among them was one ram whose image I will never forget! Standing silhouetted against the skyline, this ram was all I have ever dreamed of in a Marco Polo sheep. With horns that came high off his head and swept down well below the jaw before coming back up, then out, with the tips pointing towards the ground, I was sure I was looking at a ram whose horns would easily exceed sixty inches. This magnificent animal was clearly the leader of this band, and rightfully so. He stayed in this location with the rest of the rams for more than an hour, with all of us taking turns admiring him through the scope, and knowing there was nothing we could do towards making an attempt for him. Over the course of the trip he was never seen again, but his image has been etched in my memory forever! Our hike out proved uneventful but we did gain the confidence to know the altitude was something we would be able to deal with. On day four, we were up by 4 AM and in the jeep by 4:45, on our way to another valley for an early start. If you are wondering why Michael and I are still hunting together instead of separately, the answer is two fold. First, we had agreed to film for each other, and second, since my rifle did not show up at the airport, there was only one decent rifle in camp. Neither of us felt comfortable using the Russian 7.62 to try a 400 yard shot. Besides, with as many rams as we were seeing, we were both sure we would connect without too much trouble. We again saw many rams in this new valley, but it wasn’t until we had returned to the jeep and were on our way back to camp that things got really interesting. On our way back we took a detour which gave us an opportunity to check yet another valley before dark. Finding it loaded with sheep we eased our way further along in the jeep as the afternoon light began to fade. 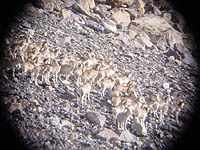 A sudden flurry of excitement among the Tajik guides alerted us to the fact that a group of rams had appeared out of a fold in the mountain on the right side of the jeep. As they made their way up the hill, we could see one ram was exceptional. Immediately the jeep was turned to the left so the hood could be used as a rest, and quickly shut off. Michael bailed out to try and take advantage of this unusual opportunity but a problem soon became evident. The driver, used to right handed hunters, had instinctively swung the jeep to the left, but Mike being a south paw, was unable to get a proper rest. He quickly scrambled into a shooting position across a rock on the ground to attempt what was by now going to be a five hundred yard shot. As the range was called out to him he waited for the biggest ram to be clear of his companions and then squeezed the trigger on the Remington 7MM Magnum. You could see by the reaction of the ram he was well hit. In the fading light the decision was made for them to come back the next day to try and recover the ram. Michael and I decided to split up for day five so he could take the time necessary to both recover and photograph his ram, while I continued to hunt for mine. We covered much country on this day but only saw about twenty rams, none of which were in the category I was seeking. The biggest thrill of the day was when I returned to camp that evening and viewed Michael’s sheep! It exceeded our best estimates by two inches, taping out at exactly sixty inches on the left horn. In reviewing the video it appeared the right horn may have been slightly shorter than the left, but the horn tip was damaged when the ram fell, and now taped fifty-six and one half inches. With both bases exceeding 15 inches, one could not ask for a better, or more impressive Marco Polo, and Michael was rightfully pleased! His excitement was contagious and the whole camp was thrilled with his trophy. Over the next several days, a variety of attempts were made to use all techniques available to us to put the odds of taking a big ram in our favor. There were mornings when we were up a 4:00 AM and on the road to the hunting area by 4:30. In this way we were able to hike up the main part of the valley without being easily seen by the sheep that were feeding in the area. This was productive, but did not produce a sighting of the kind of ram we were after. We also tried many new areas that no one had been to this year, and again found rams, some of them very good. One in particular looked like the kind I was after and so we planned a stalk that would take us along the edge of the valley floor, ending just below the bedded sheep. Then it would be a matter of climbing up over the lip of the hill for a rather long shot. This plan worked well until we experienced a shift in the wind which carried our scent up to the rams. The first sighting we had of them was as they were running up the mountain heading for the top of the ridge. I tried two shots at the biggest ram, at the insistence of my guide, and maybe even would have felt comfortable doing so at such extreme ranges if I had been shooting my own rifle, but with this borrowed weapon I really had very little confidence I could make such a shot. Just to make certain the ram was not hit we began a climb to the top of this ridge. We actually started up on the back side which would give us a better view of the area in which the sheep departed. This would turn out to be the toughest climb of the trip, and before we were done we had reached an altitude of 17,200 feet! This climb marks the highest I have ever been, and I can honestly say I have no strong desire to go back up there, unless of course there is a big sheep involved! The lack of oxygen at that altitude is not a pleasant experience, but the beauty of the scenery somewhat makes up for it. From where I stood on the top of this peak, I could see mountain ranges in four different countries. 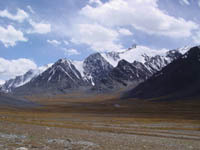 Looking to the East was Afghanistan and the Wakhan Corridor; beyond that I could clearly see the Hindu Bush Mountains in Pakistan; turning to the North I could look deep into China and see a range of mountains that held a peak called Macdagadan. This incredible peak reached skyward to more than 23,000 feet! And, off to the West were many more peaks within Tajikistan which we had already searched for sheep, all of them impressive in their own right. No sign of the ram was found after a thorough search so we began our decent off the hill. Going down was considerably easier than the ascent and I was actually enjoying myself. I got into a rhythm of walking that was quickly carrying me down the mountain ahead of my group. Sasha, (we called him the “Old Wolf” since he had been in these mountains hunting for so long) was having back problems which was slowing him down. Kaan didn’t seem to be comfortable descending in a scree slide so he chose another route. I have always enjoyed a good scree slide as it almost simulates skiing, and can really get you off the mountain fast. After a couple of long runs my legs began to burn a bit so I decided to take a rest, and it is a good thing I did. While descending, the scree is quite noisy and had prevented me from hearing the yelled warnings coming from several hundred yards above me. It seems Kaan’s course had brought him across directly above me where he had accidentally loosed a boulder the size of a large watermelon. It was now careening down the mountain directly at me with unbelievable speed. I took just a second to watch it to make sure I picked the best direction to run, and then made a mad dash to my left. In just seconds the boulder came crashing right through the location where I had just been sitting! I’m certain it would have centered me if I had not moved. The rest of the day was uneventful as we made our way back to the comforts of our camp. I slept well after dinner with no ill effects from our ascent, although some of the others were complaining of severe headache through the night. For me there is always a special air of excitement on the last day of any hunt. The fact that you have made it to your last day of hunting without taking your animal means there have been many exciting events already, as there always are in a hunt. And, over the years, I have had some of my greatest hunting days on the last day. I am always extra excited, and full of anticipation about what the day will hold. On this last day I was teamed up with what I felt was the best sheep hunting team in camp; Attabeck and Sasha. As we began our drive to a location chosen by the two sheep guides, I knew that, at the very least, we were going to have some excitement. As usual, the jeep ride was another bone jarring experience which completely negates the need for coffee to help you wake up. The ride itself provides more than enough exhilaration to bring you fully alert. As our drive progressed I could see we were returning to a location we had hunted the first day of the trip. I knew the area held many sheep and was confident we would have a good chance to find and stalk a big ram. We eased the jeep to a location just below the lip of the saddle and got out to walk over to the edge where we could peer down into the valley without being seen by the sheep. It was still early enough that long shadows extended across the valley floor, and many sheep could be seen feeding in several different locations. It wasn’t long before Sasha and Attabeck had spotted a group of rams which contained a very large animal with impressive horns atop his head! 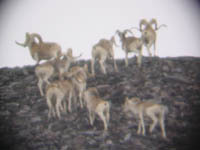 this band of seven rams were feeding about two kilometers away, across the valley at the base of a big scree slide. It wasn’t long before they began to move up into the scree and situate themselves in their first morning bed. We began our stalk in plain sight of the sheep, only our initial course took us away from the sheep on a diagonal that would eventually take us behind a ridge that would give us the cover necessary to make a more direct approach. We moved slowly and the sheep watched us without reacting. Once out of the rams sight we were able to turn towards them and pick up our pace. Periodically we would have to stop to allow for ewes and lambs to move off from our path, all the time hoping they wouldn’t spook the rams. As we were closing the distance out target rams got up and began to feed up the mountain and it wasn’t long before they were out of sight over the ridge. Again we fell in behind them and continued our advance. After crossing two low ridges the sheep had again worked there way out onto the valley floor. As we came over the third rise a little too fast we saw the sheep feeding below us at about 500 yards. I felt I could have laid down and taken a shot from there, but one of the young rams had seen us when we pooped over the top, and he began a trot that quickly took them beyond my comfort range. Again they started to feed and the waiting game was back in effect. As they approached the river and began to cross something totally unexpected happened. The whole band of sheep, which now consisted of a group on ewes and lambs as well as our seven rams, took off running at top speed! Looking behind them I spotted two wolves running at top speed. This chase lasted several hundred yards before the wolves gave up and headed back towards the river. Needless to say this put an end to our sheep hunt, as this group of sheep continued up into the mountains at a fast pace until they disappeared into Afghanistan. I got a very good look at the big ram we were chasing one final time as he crested the ridge. I am comfortable with the estimation of at least sixty inches of horn on each side of his massive frame. As we laid on the ridge watching the wolves that had just spoiled what was likely our last sheep opportunity, I couldn’t help but wonder if there was a way to get a shot at them. They were now close to 1000 yards away and directly upwind of us. the two wolves began moving around below us to the North and, as they did so, became a little more crosswind from us. Attabeck and I decided to see if we could howl to bring them in range for a shot. Our first attempts were in vain as the pair still could not hear us. There course continued to carry them further to the downwind side and on our third attempt the big male picked up his head and stared exactly at our position. We carried on with our howling and both wolves began running at us from about 700 yards out. At the time this all started, I had taken the video camera from Michael and was filming the action. The challenge now would be to get the camera back in his hands, get the rifle in mine, switch from a sitting position to a prone position, all without spooking the wolves that were closing in on us fast! I decided to wait to the very last minute to do this and so continued filming the advancing wolves until they were under 200 yards. Without Michael moving, I slid the camera forward and down to his waiting arms. I then leaned across Attabeck to reach the rifle, and roll myself into a prone shooting position, while at the same time, bolting in a round. The wolves were now waking up to the deception and I knew we didn’t have much time. I had intended to shoot the big male first but must have lost track of him when I was getting in position to shoot. I centered the crashers on the first wolf to appear in my sights, thinking it was the big one. As soon as the crosshairs were steady I shot and the wolf went down. The second wolf was now running from right to left, in a direction I could not shoot because both Michael and Attabeck were on my left in tight formation. Attabeck again began howling which stopped the wolf. he looked back at the female who was still thrashing around and came running back to her. As soon as he stopped I was able to flatten him as well. The whole experience was thrilling and even more so for our guides, as the wolf population in this area is very high, resulting in tremendous losses to the local sheep population on an annual basis. Their estimates were that each wolf would account for approximately forty sheep per year. This is very believable considering one mountain lion will kill around fifty-two deer per year. We had a bid celebration on the side of the mountain reliving an event that is certainly more rare than the taking of a big ram. I’m not necessarily saying I wouldn’t rather have taken a big ram, but I was certainly thrilled at the whole experience that had just taken place! The wolves were beautiful with very nice fur, the big male weighing close to ninety pounds! According to both Sasha and Attabeck this wolf exceeded the size of the biggest wolf they had ever seen in this area. He also had a very nice sized head which will make a fine display. After three trips to this unique country I still don’t feel I have compiled enough footage for a feature film. I have plans to return once again in December of 2004. Hopefully, I will then be able to get the ram of my dreams, like the one I keep seeing silhouetted against the sky and snow, an image that will never leave my mind’s eye!